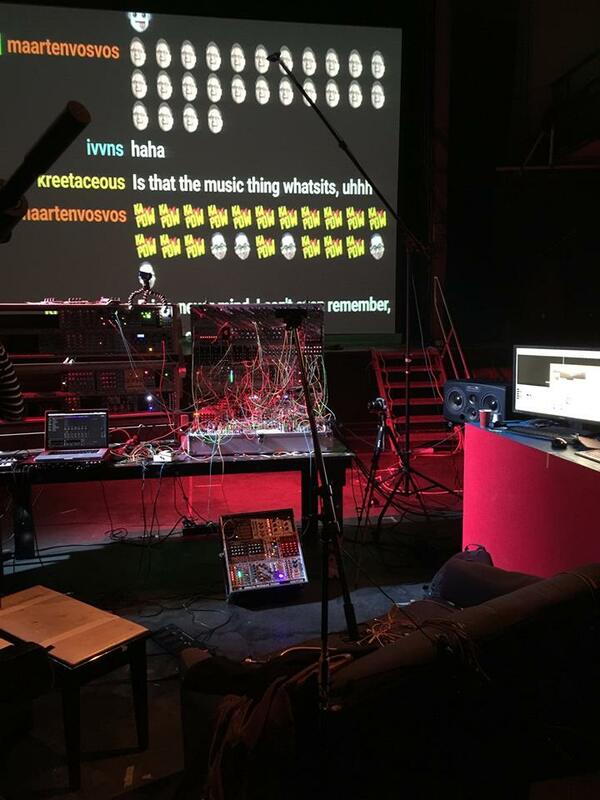 You might think that rigging a giant rack of modular synths and burying them in a tangle of synth cords and then live streaming a performance jam on them for nearly twelve hours straight is self-indulgent and overkill. And you’d be right. But if you also thought it would be no fun to watch, that it’d be joyless and involve lots of noodling, you’d be very wrong. Very wrong. Like – maybe you should get about twelve hours free. That’s because the guy behind this insanity is talented synthesist Colin Benders. And not only is he an amazing musical performance, but he produces some real comic gold in the process. He carries a handheld mic and narrates the whole thing. He talks to viewers. And then he turns over the entire system to control by the people following the stream, allowing viewers to manipulate the music. (Even step-by-step sequencing control. For real. It appears to allow him to take a bathroom break.) He explains what’s going on for those not in the know. The live sequencing idea is especially genius – he rigs up the sounds, then turns over sequencing control. And he produces unexpectedly tuneful melodies and gently funky grooves. Seriously, you can queue this up while working or (gah) doing taxes or something, and it’ll bring a smile to your face. You won’t have to touch YouTube for twelve hours. It’ll probably make your day. The online sequencing tool is available on his website, so you may want to tune into the next marathon. You can also catch Colin at Awakenings, where I think he’ll be the single coolest person there. There’s just one problem. Now for any of us trying live streaming in the future, dude, we’re not worthy. Thanks to Jan Klooster for the tip [via Twitter]!